Here is a look at both of Arbour’s careers — as a player and as a coach — illustrated with various hockey cards and collectibles issued over six decades. 1949-50 to 1951-52 – During Arbour’s first three years of junior hockey, he did not appear on any hockey cards or collectibles. 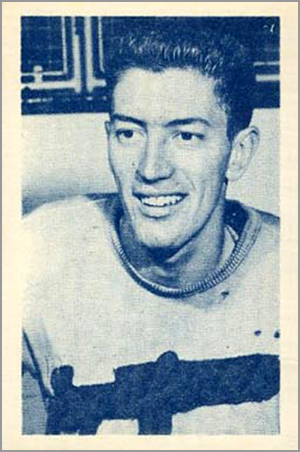 1952-53 B & D OHA/QJHL #5 – Arbour’s earliest known card is from the 1952-53 season and pictures him during his last year with the Windsor Spitfires of the the junior-league Ontario Hockey Association (now OHL). 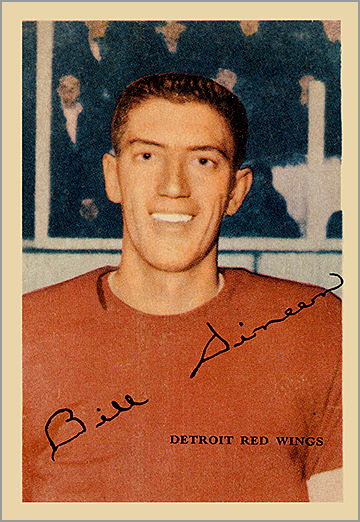 1953-54 Parkhurst #37 and #38 – When Arbour broke into the NHL with the Detroit Red Wings in 1953-54, Parkhurst made a giant error on his rookie card — they swapped pictures of him with rookie teammate Bill Dineen. 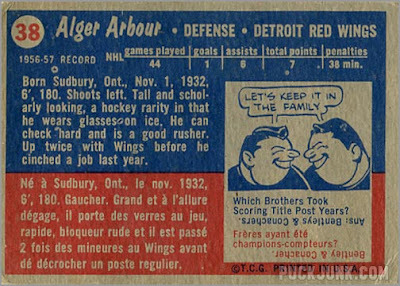 Card #37 (left) has Arbour’s name and stats, but Dineen’s picture. Card #38 has Dineen’s name and stats, but Arbour’s picture. That year, Arbour won his first Stanley Cup as a player. He also recorded one assist — his first point in the NHL — in 36 regular season games. 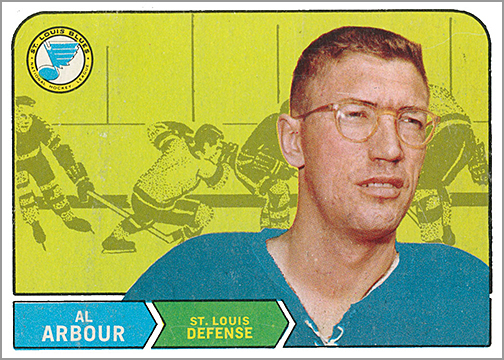 1954-55 and 1955-56 – Save for four playoff games in 1956, Arbour spent the next two seasons of his career in the minor leagues and had no cards. 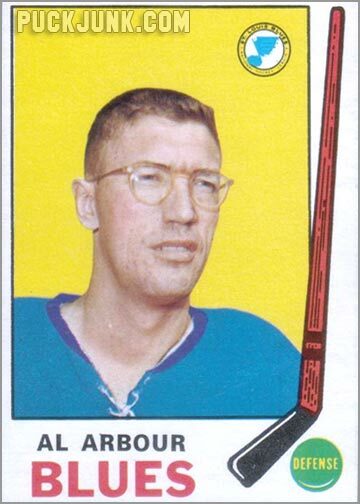 1956-57 Parkhurst “Missing Link” #6 – During Arbour’s second year in the NHL, no companies issued hockey cards. 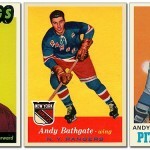 But in 1994, Upper Deck released a set of Parkhurst cards, featuring a retro design and players from the 1956-57 season. Arbour scored one goal that season, which was his first goal in the NHL. 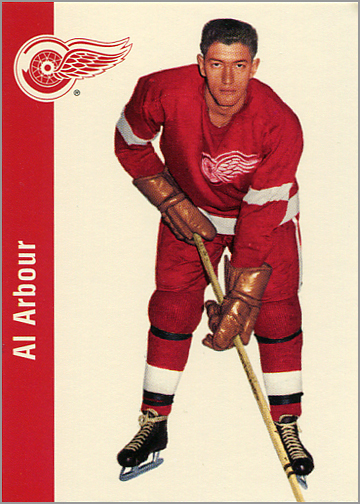 1957-58 Topps #38 – In his third season with the Red Wings, Arbour went from part-time to full-time NHLer, appearing in 69 of 70 games for Detroit. He also accrued a career-high 104 penalty minutes. 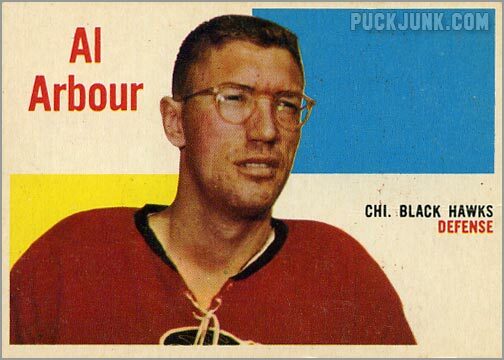 1958-59 Topps #64 – Arbour was claimed by Chicago Black Hawks in the intra-league draft, and had his best-ever point total with 12 points (2 G, 10 A) in 70 games. 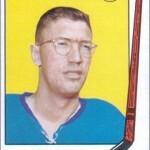 Arbour’s 1958-59 Topps hockey card was the first to picture him wearing glasses. 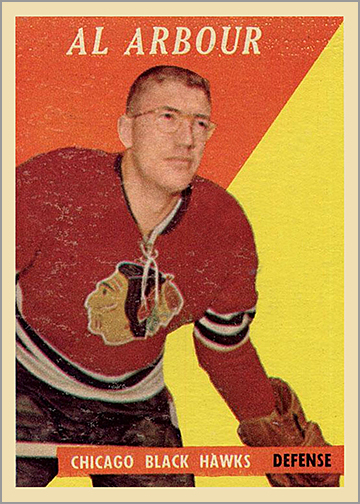 1959-60 Topps #35 – Arbour’s second season with the Black Hawks. 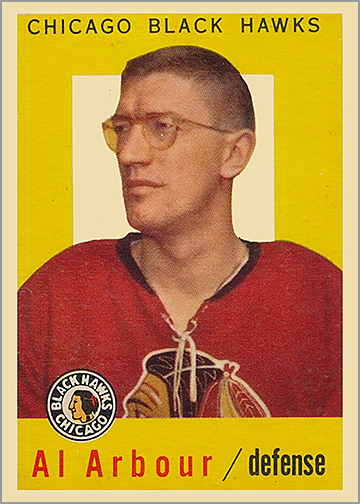 1960-61 Topps #64 – In his third season with Chicago, Arbour helped the Black Hawks win the Stanley Cup. 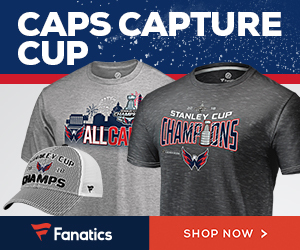 This was his second Stanley Cup Championship as a player. Also, take a good look at the photo above, as you’ll see it again — and again — later on. 1961-62 York Peanut Butter #33 – Arbour was selected by the Maple Leafs in the intra-league draft and won his third Stanley Cup Championship in 1962. He did not have any cards made that year, but did appear in a set of collectible “octagons” issued by York Peanut Butter. 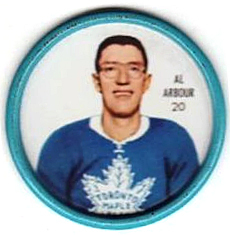 1962-63 Shirriff Coins #20 – Over the next five seasons, Arbour was a bit player for the Maple Leafs, appearing in 14 regular season and two playoff games between 1962-63 to 1966-67. Again, he did not have any cards issued, but did appear in the Shirriff Hockey Coins set. 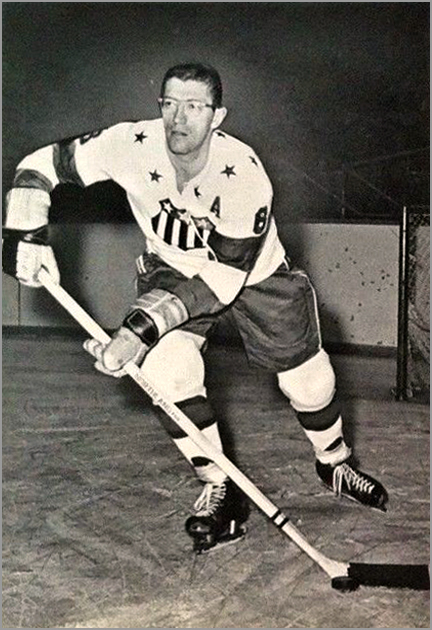 1963-64 Rochester Americans Team Issue – Arbour spent most of the season with the Rochester Americans of the American Hockey League. He has a card in the Amerks’ team-issued set. 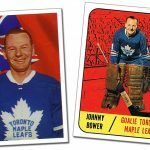 He was also member of the 1964 Stanley Cup-winning Maple Leafs, though he only appeared in six regular season games and one more game in the playoffs. 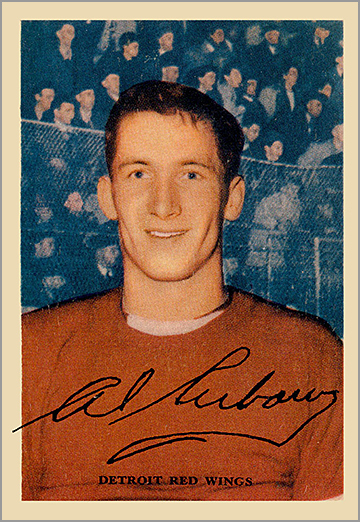 1964-65 – In his third season with Rochester, Arbour won the Eddie Shore Award as the AHL’s best defenseman. 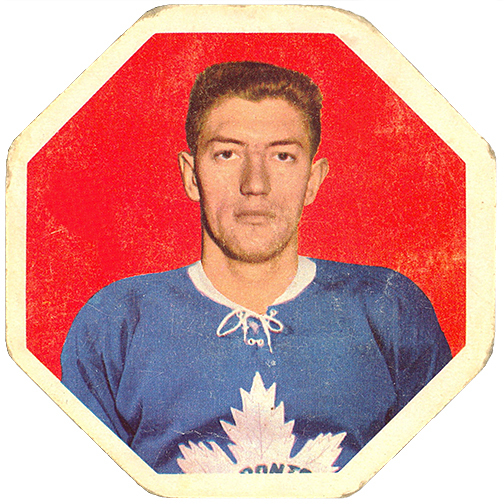 1965-66 and 1966-67 – Arbour continued playing in the AHL with the Rochester Americans, only appearing in a handful of games with the Leafs. 1967-68 – The NHL expanded from six to 12 teams. The St. Louis Blues claimed Arbour in the expansion draft, and named him the team’s first captain. 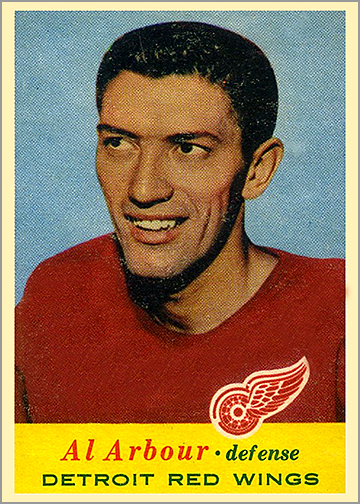 1968-69 O-Pee-Chee #128 – Arbour got a card in the 1968-69 O-Pee-Chee set. Recognize that photo? It’s the same one from his 1960-61 Topps card, but with the red Hawks jersey sloppily painted blue. 1969-70 O-Pee-Chee #178 – The same repainted photo — albeit touched up a bit nicer around the collar — would appear again next season. 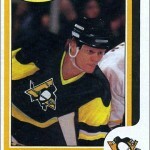 This was his last hockey card issued during his playing career. 1971-72 Toronto Sun Action Photos – Arbour started the 1970-71 season as the St. Louis Blues’ head coach, but later returned to the ice as a player for the last 22 games. 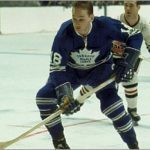 Thus, he appeared in this set of 5″ by 7″ photos released by the Toronto Sun, even though he was no longer a player in 1971-72. 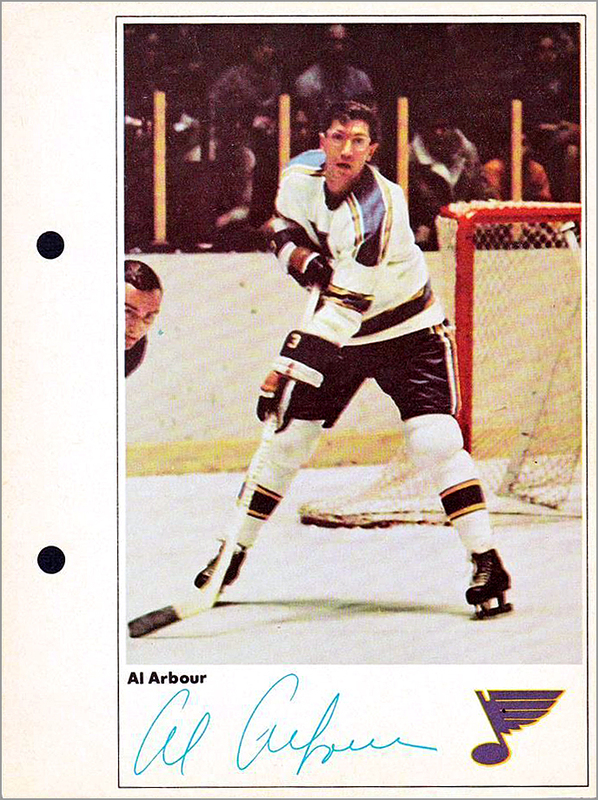 1971-72 St. Louis Blues Team Issue Postcards – Arbour returned to the bench in 1971-72. This postcard was his first card issued during his coaching career. 1972-73 – Arbour coached 13 games for the Blues before being replaced by Jean-Guy Talbot. 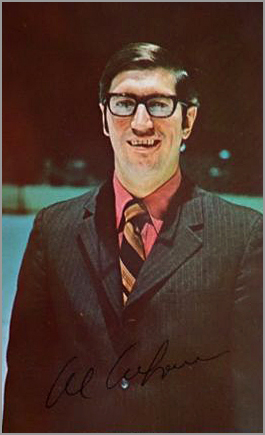 1973-74 – Arbor was hired by the New York Islanders. For the first time in his young coaching career, he served as head coach for an entire season. 1974-75 Topps/O-Pee-Chee #91 – In the ’74-75 season, Topps and O-Pee-Chee issued cards of the NHL head coaches. Arbour coached the Isles to a 33-25-22 record, — respectable marks for the third-year expansion team — and they even made it to the third round of the playoffs. 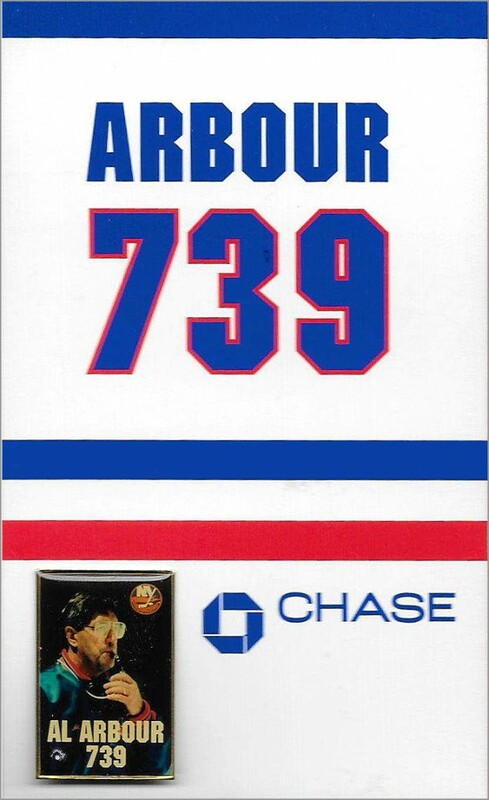 1975-76 Topps/O-Pee-Chee #92 (Islanders Team Card) – Arbour did not have a card in ’75-76, but does appear on this Islanders team photo card, which uses a pic from the previous year. He is seated in the first row, third from the left. Arbour’s coaching success continued, as the Isles posted a 42-21-17 record and made it to the third round of the playoffs for a second time. 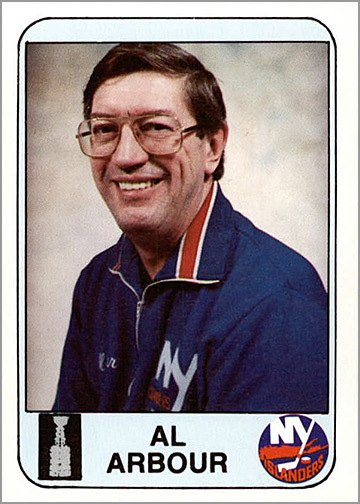 1976-77 Topps/O-Pee-Chee #142 – Arbour coached the Islanders to a 47-21-12 record, and took the team to the semifinals for the third consecutive year. He is pictured on this team card in the first row, fourth from the left. 1977-78 Topps/O-Pee-Chee #81 – Arbour winning ways continued, with a 48-14-15 record. In the second round of the playoffs, the Islanders were upset by the Toronto Maple Leafs, losing 2-1 in overtime of game seven. Here, Arbour is pictured in the first row, third from left. 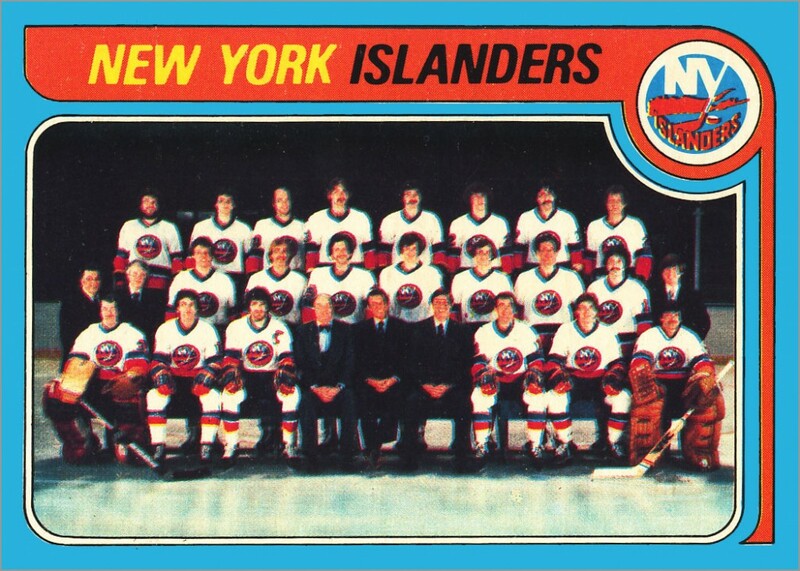 1978-79 Topps/O-Pee-Chee #201 – The Islanders finished the season with a league-best 116 points, but fell in the third round to their crosstown rivals, the Rangers. Arbor is in his usual spot (first row, third from the left) on this team photo card. He also won the Jack Adams Award as the NHL’s best coach. 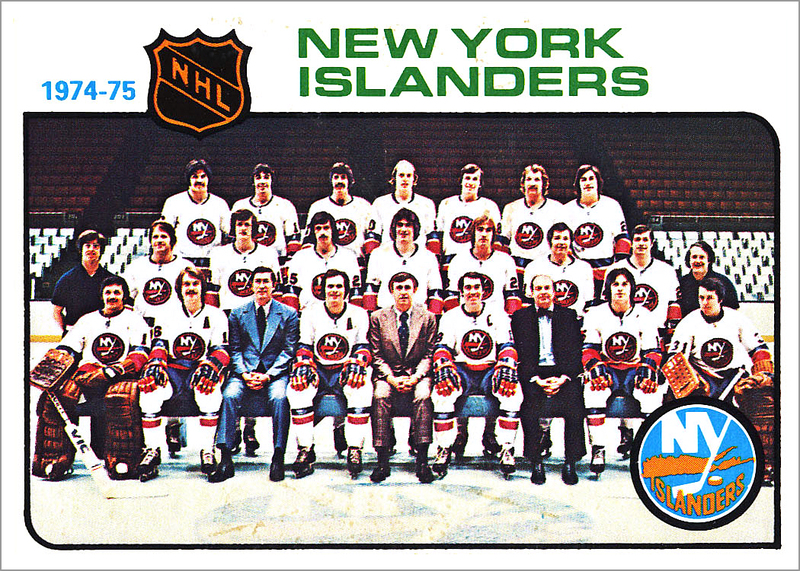 1979-80 Topps/O-Pee-Chee #253 – The Islanders won their first of four consecutive Stanley Cup Championships in 1980 when they beat the Philadelphia Flyers four games to two. Here, Arbour is fourth from the right. 1980-81 Topps Team Pin-Up Posters #1 – These small posters, measuring just under 5″ by 7″, were folded up and put into packs of 1980-81 Topps Hockey cards. 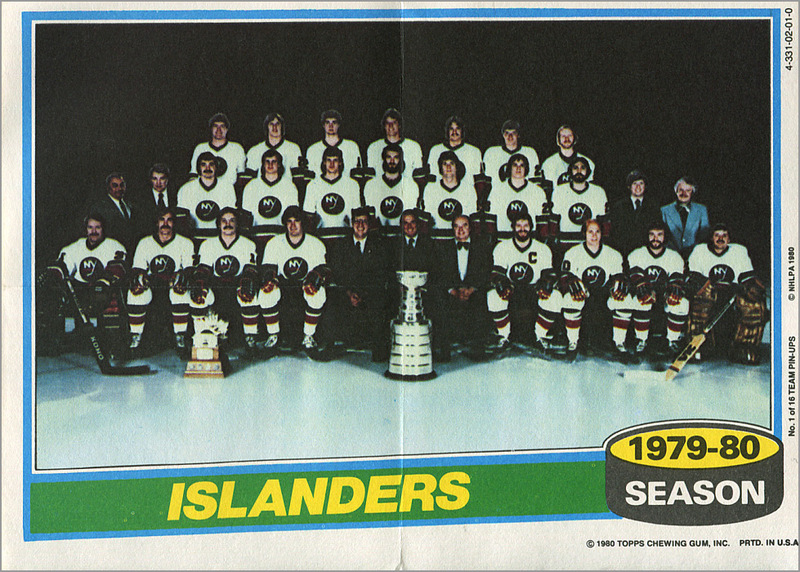 This one shows the Islanders from the previous year; Arbour is fifth from the left in the front row. 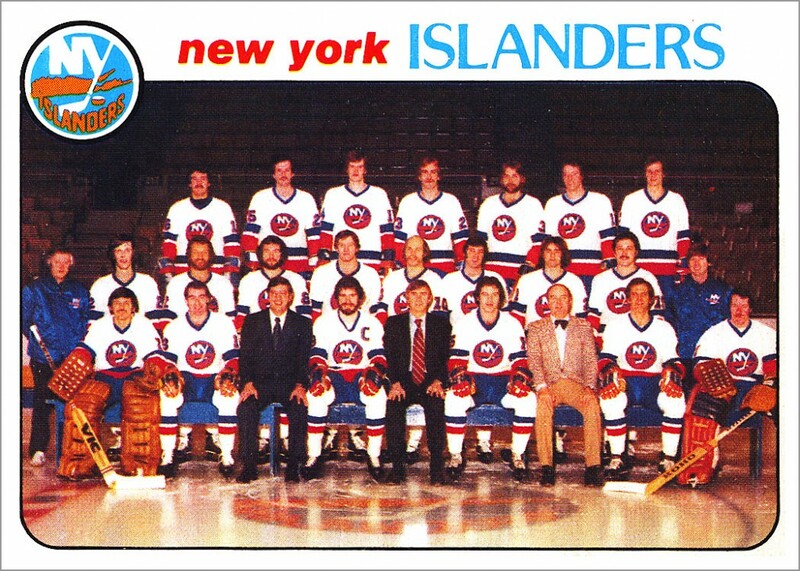 The ’80-81 season was the Islanders second consecutive championship, so the Stanley Cup does not seem out of place in this team picture. 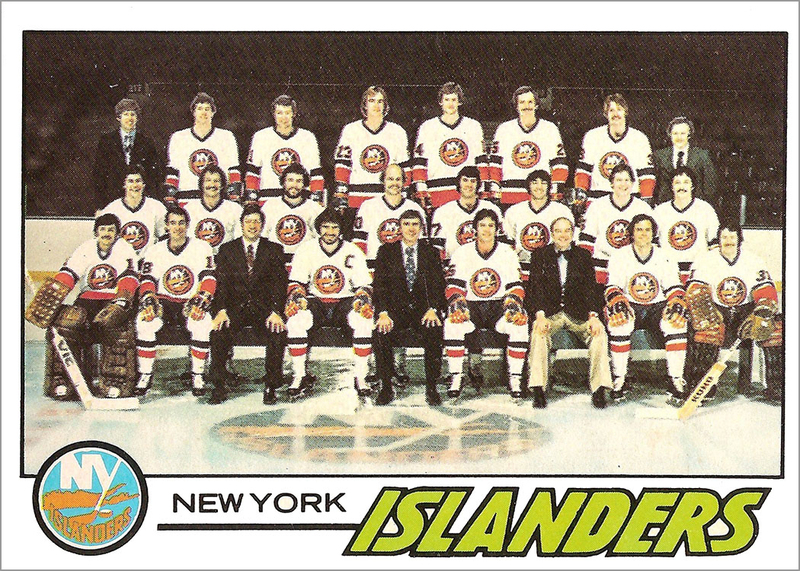 1981-82 – The Isles were tops in the league with 118 points and won their third consecutive Stanley Cup Championship. 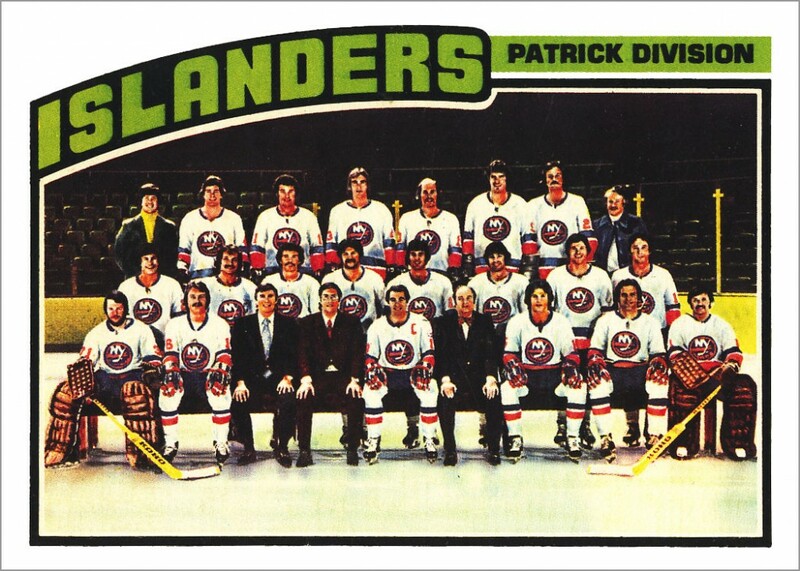 1982-83 – For the fourth consecutive year, the Islanders won the Stanley Cup when they swept the Edmonton Oilers in four games. Next year would be a different story, though. 1983-84 Islanders News #29 – Despite coaching his team to an impressive 50-26-4 record, the Islanders lost the Stanley Cup Finals in five games against the Oilers. 1984-85 Islanders News #29 – Arbour coached the Islanders to a 40-34-6 record, but the team lost in the second round of the playoffs to the Philadelphia Flyers, who would make it all the way to the Finals before falling to Gretzky and the Oilers. 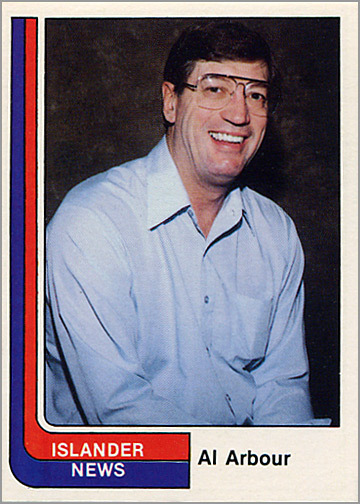 1985-86 – In his 13th year behind the Islanders bench, Arbour coached his team to a 39-29-12 record. He retired from coaching and became the Islanders’ Vice President of Player Development. 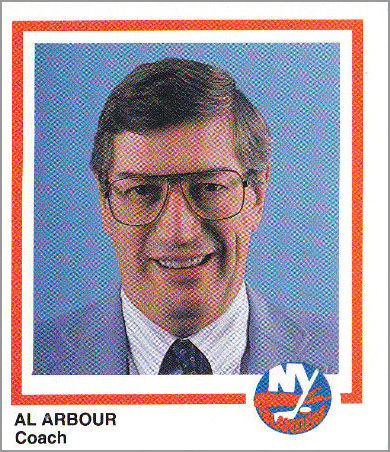 1988-89 – Arbour returned to coaching midway through the 1988-89 season. The Isladners missed the playoffs, but Arbour would remain as coach for another five years. 1989-90 Marine Midland Bank New York Islanders #29 – The Islanders (31-38-11) would barely make the playoffs and were eliminated in the first round. At this point, all of the Islanders’ big name players from the 1980s — Mike Bossy, Denis Potvin, Billy Smith and Clark Gillies — were gone. This card was part of a 30-card team set given out at an Islanders game on February 2, 1990. 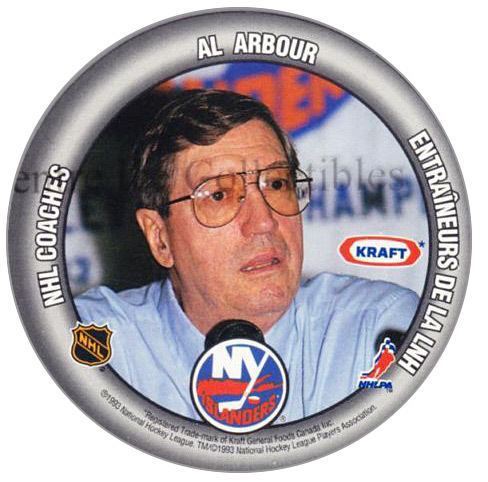 1990-91 Pro Set #671 – In his second full season during his second coaching stint, Arbour led the sad-sack Islanders to a 25-45-10 record. Five different goalies would suit up for the team that year, including Glenn Healy as the number one and a very green Jeff Hackett as the backup. 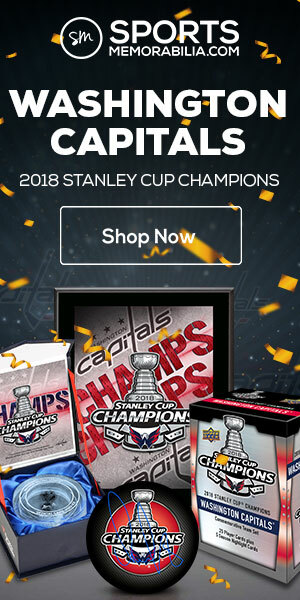 Needless to say, the Isles did not make the playoffs. 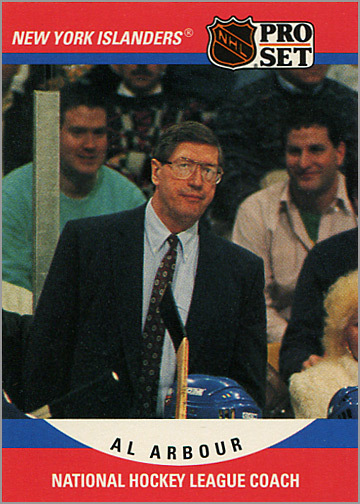 Arbour had a card in the 1990-91 Pro Set NHL Coaches subset. He doesn’t look too pleased here. 1991-92 – Arbour’s Islanders were 34-35-11 and missed the playoffs for a second straight year. 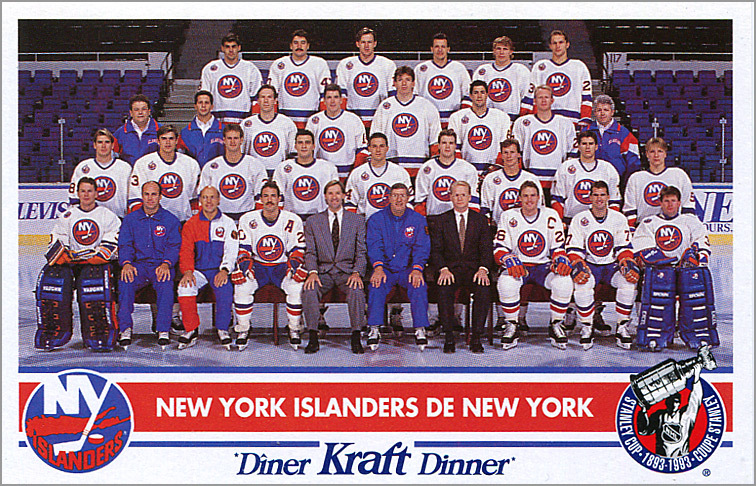 1992-93 Kraft Dinner – Although the Islanders accrued a mediocre 40-37-7 record, they upset the Pittsburgh Penguins — back-to-back Stanley Cup champs the previous two years — in the first round of the playoffs. The Islanders unlikely run continued to the third round, where they fell to the eventual champs, the Montreal Canadiens. Here Arbour is pictured front and center (as he should be) on this Islanders team photo card from the 1992-93 Kraft Dinner hockey card set. 1993-94 Kraft #27 – In Arbour’s final season of his second coaching stint, the Islanders went 36-36-12 and lost in the first round of the playoffs to the eventual winners, the New York Rangers. He retired having coached a total of 1,606 games, winning 781 of them. This disc — the last collectible issued during Arbour’s coaching career — was found under lids of Kraft peanut butter during the ’93-94 season. 1996 – Arbour was inducted into the Hockey Hall of Fame, in the builder’s category, for his success as an NHL coach. 1996-97 Banner Card – This large-sized (3.5″ by 5.5″) trading card was given out at the Islanders’ game on January 25, 1997, when the team raised a banner commemorating Arbour’s 739 wins as coach of the New York Islanders. The back lists his complete coaching record. The card came with a small lapel pin affixed to the lower left corner. November 3, 2007 – Islanders coach Ted Nolan asks Arbour to return to the bench for one more game, to give Arbour an even 1,500 games coached with the Islanders. 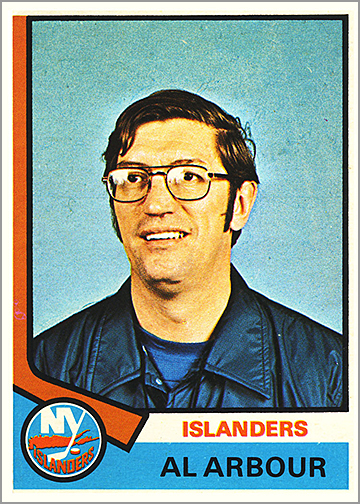 Arbour signs a one-day deal to coach the Islanders, and at age 75 becomes the oldest person to coach an NHL team. 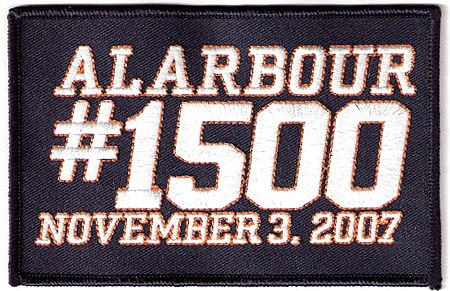 Players wear a commemorative patch (above) on their jerseys and beat the Pittsburgh Penguins 3-2 to give Arbour his 740th career Islanders’ win. Fantastic post. Really enjoyed that one. A pair of my fave Al Arbour cards include his 06/07 Parkhurst where he’s celebrating with The Stanley Cup. One of the few times I’ve seen him “let loose” on cardboard. The other is from 10/11 Dominion Notable Nicknames. His signature on the card includes his famous moniker “Radar”. Love it. Great work. Thanks for taking the time. I knew him personally my dad and mom knew him to when my mom past away he came to the church and spent the day with me and my family I have some rare photos that no one ever seen p f him I would like to see if I could give to his family members or sell them to someone any ideas…? Is there a reason for this as am wondering if he was a late added rookie or a practice player … ??? 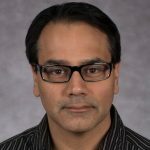 Thanks for making this informative and important entry for others to see his life in cards and photos. That is Darius Kasparaitis (second row, all the way to the right) on the 1992-93 Kraft team photo. The 1992-93 season was his rookie year. Perhaps he was one of the last guys to make the Islanders, and thus the team did not put the Stanley Cup 100th Anniversary patch on his jersey yet? Just a guess.